More than 260,000 women are diagnosed with new cases of invasive breast cancer every year, according to the American Cancer Society (ACS), and one in eight women has a chance of developing breast cancer in their lifetime. But, early detection through mammograms and advanced treatments are helping save more lives than ever before. The widespread use of mammography has been instrumental in reducing breast cancer mortality by nearly 40 percent since 1990. You can schedule your mammography appointment performed by a caring, certified female technologist here at Health Images and board-certified radiologists will read your images. The number one reason why mammograms are so important lies in the survival rates for early detection. According to the ACS, women who discover breast cancer and begin treatment before it spreads have a 99 percent five-year survival rate. Moreover, recent findings published in November 2018 in Cancer revealed women who undergo regular screenings with mammograms have a much lower risk of dying from the breast cancer within two decades of diagnosis than women who do not have screening regularly. In the past, many women didn’t consult physicians until they felt lumps. But today, mammograms can detect tumors in the breast when they’re too small for you or your doctor to feel it. Mammography allows the detection of tumors and other signs of breast cancer up to two years before women or their physicians can feel a lump. The take-home message is: mammograms help save lives. Your life could be the one saved. Who Is at High Risk for Developing Breast Cancer? Women who have received genetic testing revealing BRCA1 or BRCA2 gene mutations. Women who have first-degree relatives with BRCA1 or BRCA2 gene mutations but have not yet had genetic testing done on themselves. Women with a 20 percent or greater lifetime risk of developing breast cancer according to their family history. Women who received radiation therapies to the chest between the ages of 10 and 30. Women who have one of the following conditions or first-degree relatives with them — Li-Fraumeni syndrome, Bannayan-Riley-Ruvalcaba syndrome or Cowden syndrome. ACR reports that nearly 75 percent of women diagnosed with breast cancer are not considered high risk and have no family history of the disease. What Are Mammograms and What Are the Types? Women get mammograms — which are black-and-white x-ray images of the breast — to help detect abnormalities, such as tumors, in breast tissue. Mammograms give doctors a better idea of what’s going on beneath the surface of your skin, deep within your breast tissue, so they can determine if further investigation or treatment is necessary if they find something suspicious. Screening mammograms: These are done to detect early signs of breast abnormalities before clinical signs become noticeable. Diagnostic mammograms: These investigate suspicious changes in the breast or abnormal findings on a screening mammogram. A mammogram is an outpatient procedure here at Health Images. While you may be in our comfortable waiting room briefly before the test, the screening mammogram itself only takes about 15 minutes. A diagnostic mammogram may take a little longer at 30 minutes. You will stand for the mammogram. The technologist conducts the x-ray on a machine uniquely designed for mammography and adjustable to your height. The technologist positions one of your breasts on the machine’s platform and helps you position your head and body so the imaging equipment has an unobstructed view of the breast. Then, the technologist gently presses a clear plastic against your breast, applying pressure to the breast, so it is spread out and held still. This prevents the images from blurring from movement. The technologist requests that you hold your breath briefly and stand still while the imaging takes place. The technologist performs this process on both breasts before asking you to wait while they check the image quality to make sure there is no reason to take further images. You may be asked to wait for about five or ten minutes while the technologist makes sure all the images are clear and none need to be retaken. Once the images are approved, you can dress and go on with your day. Overall, you should expect to spend an hour or less for the entire procedure. How often you should be scheduling your mammogram depends on a few factors including your age, your risk for developing breast cancer, your breast density and your doctor’s recommendations. There is no general conclusive consensus among the medical community of when to get a mammogram. The Centers for Disease Control and Prevention (CDC) provides an overview chart of the breast cancer screening guidelines according to the published recommendations of various authoritative organizations, such as the United States Preventive Services Task Force (USPSTF), American Cancer Society and others. For instance, the USPSTF, which is an organization comprised of disease experts and physicians who review research on the optimal way to prevent diseases and make recommendations on how doctors can help patients avoid diseases or find them early, has published breast cancer screening recommendations. The USPSTF guidelines recommend women of average risk who are 50 to 74 years old get a mammogram every two years. Women 40 to 49 years old should talk to their doctor or other health care professional about when to start and how often to get a mammogram. Women should weigh their unique risks and the benefits of screening tests when determining whether to begin getting mammograms before age 50. Women who are at high risk of breast cancer engage in yearly MRIs and mammograms beginning at the age 30. Women between 40 and 44 have an option to begin having a screening mammogram every year. Women 45 to 54 should get annual mammograms. Women 55 and older can elect to get a mammogram every other year or choose to continue getting yearly mammograms. ACA recommends women continue getting a mammogram yearly as long as they are in good health. That being said, women should schedule mammograms according to their own interests in improving their chances of recovery from breast cancer and their physicians’ recommendations. The American College of Obstetricians and Gynecologists (ACOG) recommends that women aged 40 to 74 have a screening mammogram and clinical breast exam once per year. 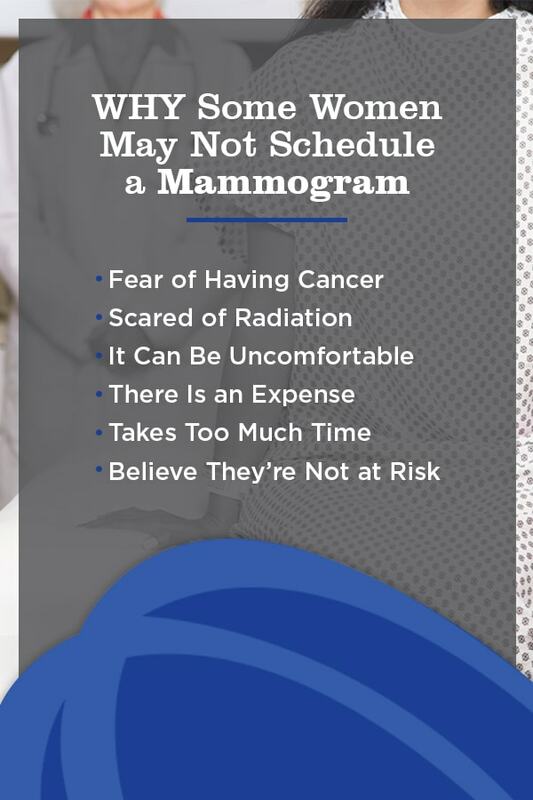 Because you are unique, and your risk factors and needs are different, work with your doctor on when you should be scheduling your mammogram. Schedule wisely. If you’re pre-menopausal, you’ll want to schedule as close to the week after your period as possible as this will be the time when your breasts are typically least tender. Skip the deodorant or antiperspirant. Deodorant or antiperspirant under your arms or on your breast can interfere with getting the best pictures from the imaging equipment, or appear as white spots on your images. You should also avoid talcum powder, lotion and perfumes that day as well. If you are wearing it during your appointment, you may ask for wipes or a washcloth to remove deodorant or antiperspirant before your mammogram. Consider taking an over-the-counter pain reliever. You can take them an hour before the exam or immediately afterward to help ease any discomfort to your breasts. Dress in a two-piece outfit. You’ll be asked to remove your top. This means wearing a dress is not the best choice, and two-piece outfits with tops you can remove easily are a more convenient option. Ask when the results will be ready. If you haven’t heard anything about the results by the date provided, call your physician for more information. These tips will help ease potential physical discomfort, and reduce the risks of being asked to have an unnecessary follow-up mammogram. Among the biggest reasons women struggle with scheduling mammograms is fear. Not necessarily the fear of the examination itself, though that plays a role for some women. Many women have anxiety about what the examination will reveal. Few types of cancer strike fear in the heart of women more than breast cancer. For many women, their breasts are closely tied to what they believe is their femininity or perhaps their motherhood. The thought of losing one or both of their breasts to cancer can be scary. The reality, though, is that early detection with mammography may be instrumental in reducing the need for a mastectomy altogether, helping you save your breast as well as your life in the process. Additionally, not all abnormalities found during a screening mammogram are breast cancer. The fact is the radiation used in digital mammography is low-dose. For most women, the risks of low-dose radiation outweigh the benefits. The process can be uncomfortable for some women, though certainly bearable. Your compassionate Health Images technologist will help you feel as comfortable as possible. Money is another reason women often fail to schedule mammograms when they should. Fortunately, many insurance plans provide coverage for mammograms. Women think it will force them to miss work or sacrifice family time to get their mammogram performed. Fortunately, you can probably be in and out during your lunch hour. Here at Health Images, we have early morning appointments starting at 7 a.m., evening appointments until 8 p.m. and Saturday mammograms by appointment. Because it is an outpatient procedure and no anesthesia is required, you can return to work immediately after the x-ray is complete. Another factor that prevents women from scheduling their mammograms is the belief that this is something only older women need. The truth is that breast cancer can strike at any age, and the many women who are diagnosed with breast cancer each year do not fall within the “high risk” parameters for the disease. You may be advised to have follow-up imaging if abnormal results show in the initial mammogram. Don’t be alarmed if this is the case for you. Follow-up or diagnostic mammograms are not necessarily bad news. They can clarify imagery found in the initial mammogram screening. Calcium deposits: Ducts and other tissues can contain calcium deposits. Masses or lumps: Not always indicative of cancer, but certainly worth a more detailed inspection. Dense areas that aren’t uniform to both breasts: Your breast tissue might not be the same in each breast. Dense areas are less fatty than glandular, making it more challenging to identify masses or calcifications. Dense areas that are new: You may have new dense areas not appearing on your most recent previous mammogram. While a mammogram is a vital diagnostic tool for determining if you might have cancer, a breast biopsy may be the next step to identify if you do have cancer. The imaging tools rule out other possibilities, reducing the number of unnecessary biopsies, which are far more invasive procedures. Is a Mammogram the Right Choice for You? Getting a mammogram is something that takes only a matter of minutes but can add years to your life through early detection. Mammography is a tool of broad positive impact when it comes to taking the fight to cancer before it has a solid footing in your body. Today is the day to take your health into your own hands and schedule your mammogram at one of the many Health Images locations near you. If it reveals nothing, you’ll have great peace of mind. However, early detection of breast cancer can mean the difference between life and death. You are worth that peace of mind, and you deserve it.